Listen to this podcast on our site by clicking here or subscribe to FS Insider by clicking here. 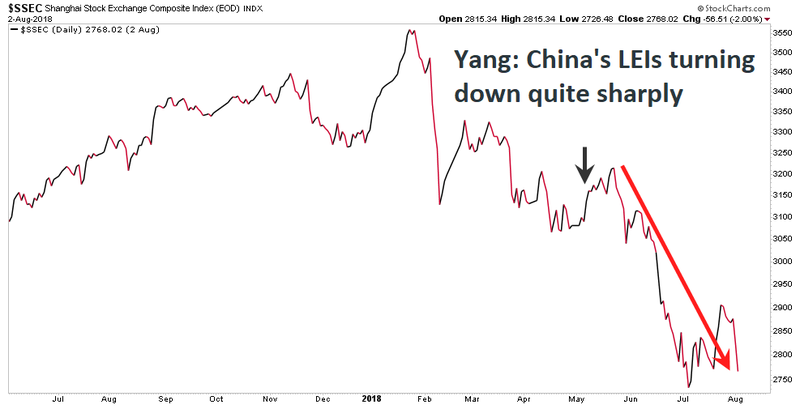 Earlier this year, Variant Perception's Tian Yang told FS Insider listeners that China's LEIs were turning down “quite sharply”, and we've now seen a fairly steep decline in the Chinese stock market since. Variant Perception recently released a report titled Understanding EM Crises, looking at the history of emerging market contagions, how they unfold, and "when they become contrarian buying opportunities." The entire report can be downloaded for free by going to www.variantperception.com/financialsense. When it comes to China, White said, Variant Perception’s main leading indicator is liquidity. There are a number of other inputs, he added, but watching liquidity is one of the best ways of trying to gauge what's going to happen. Earlier this year, some of these liquidity inputs were beginning to roll over. China has been focused on environmental reform and also reigning in the shadow financing sector. To that end, we’ve seen a large amount of deliberate tightening on China’s part, which had the intended effect of collapsing this shadow financing sector. However, now we’re seeing the first signs that China is beginning to ease, possibly to head off too great a slowdown. China has begun to apply the accelerator, White noted, but monetary policy operates on a lag, so they won’t get an immediate reaction. This is why a Chinese slowdown is baked in the cake, he stated. With China being the world’s second largest economy and the largest consumer of commodities, it’s worth considering where these markets fit with the impending slowdown on the way. Along with the slowdown in China, we're now beginning to see commodity leading indicators, which don't have direct China input, also beginning to slow. It’s worth noting that White focuses on raw industrial commodities, as this helps reveal the true picture of what’s going on and not one that’s likely to be manipulated or affected by speculators or specific market behavior. Over the last few weeks, these indicators have forecasted negative returns for commodities. On top of that, some of Variant's leading indicators that look at global liquidity have also begun to turn down.